Famous Dogs from our Childhood is a quick visit to those times when we enjoyed the dogs that entertained us. For some they are old friends and for others perhaps passing moments of entertainment. From cartoons to movies these dogs have brought us good times. I know you will see some of your favorites here. For me it was RinTinTin, Lassie and Snoopy so you know my age range if you recognize these great dogs. Well, maybe not Snoopy. This remembrance of these special dogs is from the ASK in Your Face blog. Give them a visit and check out all the great information they have to share. Lets take a look at the list of World Famous Dogs. Laika – The first living creature to orbit earth in 1957 via Sputnik 2. Togo – a Seppala Sleddog who was the real hero of the alaskan medicine run, running the longest and hardest and saving the medicine many times (he even jumped into the freezing waters with the rope to pull a chunk of ice with the sled and medicine to pull it to the other side). sadly, because balto got the last run into town, he was honored instead of Togo. Balto – Sled dog that helped relay lifesaving medicine to remote Alaska in 1927 and inspired the annual Iditarod. Moose – The real dog that played the fictional Eddie on the long-running TV series, Frasier. Spuds McKenzie – This Budweiser spokesdog was a real party animal, despite the fact that the Bull Terrier was a female. Anubis – The half dog, half jackal Egyptian god of the dead and guardian of graves, including Tutankhamen’s tomb. Marmaduke – The famous cartoon Great Dane who’s always getting into scrapes. Snoopy – Whether he’s Joe Cool, the Red Baron, or just plain Snoopy, he is perhaps the world’s most famous Beagle. Lassie – For over 50 years, this fictional TV Collie has been the ideal dog. Beethoven – Due to a successful movie of the same name, this St. Bernard became a canine superstar. Old Yeller – This movie about a dog of the same name is a great argument for getting your dog vaccinated against rabies. Cujo – Stephen King’s frightful “tail”. Odie – You know, Garfield’s best friend. Toto – Dorothy’s cute little Cairn Terrier in The Wizard of Oz. Goofy – Mickey’s sidekick and a Disney classic. Spanky – The lovable favorite dog of ”The Little Rascals ” my favorite famous dog! I was surprised and a little saddened to find that Lassie was “fictional” -Excuse Me! Is that possible? If you know please comment below. I hope you enjoyed this quick look back at Famous Dogs from our Childhood. And, should you need a website specializing in pet containment and transport please give us a visit. Petie was the Little Rascals dog. Spanky was one of the little Rascals. It’s amazing. Many many thanks. Maybe they listed Lassie under “fictional” because she was on a T.V. show. Or, maybe they just made a mistake. Still Lassie was a living breathing dog. 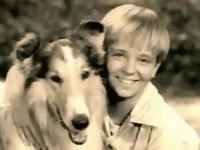 We even had a collie back then that loved to sit and watch Lassie with us as kids. What a great memory. Thanks for bring it back. Dear Heartgard, So true about Pluto. Odie got in so what about Pluto, a dog many of us grew up with and still can be seen today. @Bill Beavers: My pleasure. :) Thanks also for the email. I also notice that you haven’t mentioned Pluto, Mickey’s beloved canine. I believe he is also a Disney classic along with Goofy. Heartgard for Dogs: Thanks for your comment. I’m sorry to say that I don’t know or remember “Snowy”. Glad you do though. I’m sure Snowy brought a lot of happiness to many. Hmmm, let’s see if there’s anything left.. What about Snowy? Tintin’s white dog? I assume Snowy is the most intelligent white fox terrier, isn’t it? Okay, let’s start voting for our favorite in each category. Note: If that skateboarding Bull Dog was listed, I would have picked him!